Ages 10 through 17. Help students expand vocabulary knowledge, comprehension, and verbal association skills using the activities in this book. 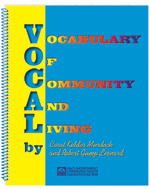 The activities in VOCAL facilitate the development of comprehension and oral expression within contexts that are relevant to the interests and experiences of students. In Part 1, the lessons focus on the vocabulary and meaning of phrases from store signs, billboards, direct mail advertisements, and situations within the community. Students are asked to define words contained within these phrases, to give synonyms and antonyms, to rephrase statements, and to use specific vocabulary to construct new messages. In Part 2 of this book, students are asked to identify words after listening to a series of clues. Each worksheet includes 20 clues that can be read by the student or presented orally. Students are asked to discuss possible answers as they progress through the list of clues, to give reasons for their answers, etc. By integrating VOCAL into the classroom language curriculum, the activities can be highly effective in stimulating thinking skills that are critical for academic success.